In the 1880s the first transcontinental rail line was completed across southern Arizona, opening the territory to far-flung markets and stimulating an unprecedented natural resource extraction boom. Ranchers filled the rangelands with commercial cattle, mining companies spawned boom towns like Tombstone and Bisbee, loggers cleared many of the forests for fuelwood and mine timbers, agriculture spread along the valleys, and Tucson, one of southern Arizona’s population centers, grew into a hub of financial and political power. Between 1880 and 1980 millions of tons of topsoil were lost, the air was fouled with urban and industrial pollutants, streams dried up, native fish were nearly extirpated, once rich grasslands were converted to thornscrub desert, and the mountain forests grew increasingly vulnerable to catastrophic fires. This result was not inevitable or necessary, but grew from choices shaped by the worldview of the people who settled and dominated the region after 1880. Fortunately, this deteriorated state of land health is being slowly reversed by residents of the region today with a new vision of environmental stewardship and a new commitment to restoration and sustainability. In the 1980s and 1990s, traditional ranchers in the Malpai Borderlands Group launched an innovative program to restore their deteriorated grasslands. Local leaders of the Audubon Society and Nature Conservancy acquired and preserved exemplary remnants of healthy native ecosystems. Environmental and civic organizations used public participation laws enacted in the 1970s to pressure federal and state land agencies to reform their management policies. Neighborhood coalitions and environmental NGOs in Tucson organized to improve air and water quality, and reform urban growth policies. 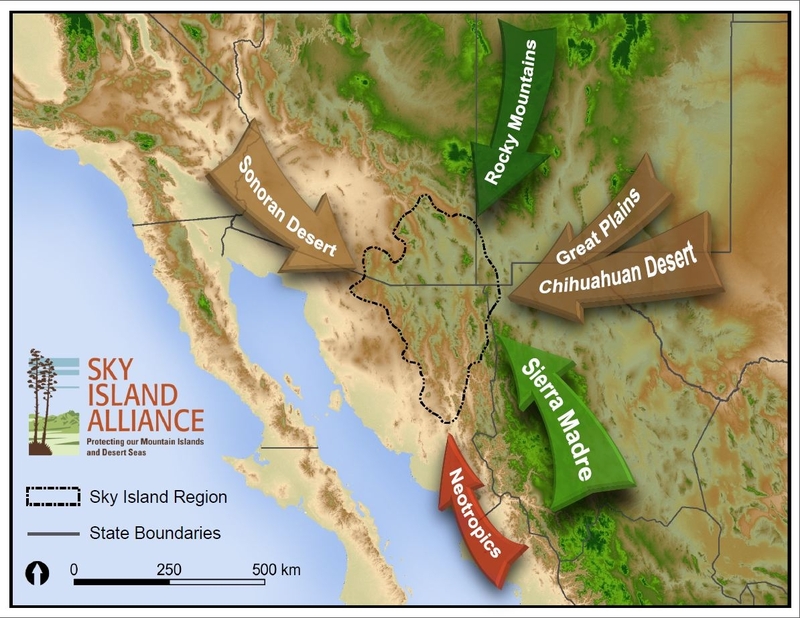 A grassroots organization called the Sky Island Alliance (SIA) formed in 1991 specifically to protect and restore the rich natural biodiversity of the sky island region employing citizen science and community collaboration in both the U.S. and Mexico. Citizens effectively organized to change culture, policy, and economic incentives to facilitate a slow but steady reversal of a century of ecological decline. The Sky Islands lie within the black boundary line, spanning the US-Mexico border. The plants and animals and climates of the region are influenced by five overlapping biotic provinces: the Sonoran Desert, Chihuauan Desert, Rocky Mountains, Sierra Madre Mountains, and Neotropics. This biogeographic diversity along with the topographic diversity of this mountain and valley landscape creates a region of biological diversity unparalleled anywhere else in North America north of Mexico. One of the most remarkable things about this good earth is its astonishing diversity of life. Something like 8.7 million different species of living plants, animals, insects, etc. share the planet with us (Mora et al., 2011). We are just one among millions. But we are a very powerful, influential minority. So powerful that many opinion leaders are claiming we now live in a geological epoch they call the “Anthropocene”—an era in which the human species has become the dominant influence on the planet’s physical and biological systems. That status has moral implications and comes with special responsibilities. Are we free to do as we please, as libertarians would have it, or do we have both practical and ethical obligations not just to each other as human beings but to the whole diversity of life evolved on this planet? Concern for the preservation of life, in all its forms, has deep historical roots, but as a broadly shared cultural value and as an international policy objective, the preservation of biological diversity is barely a half-century old. One human generation. In the United States, the Endangered Species Act of 1973 marked the symbolic turning point indicating broad public support for preserving native biological diversity. This law had its precedents and its limitations, but it remains today one of the strongest environmental laws in the land. It is unusual in that it is designed to benefit other species, not humans. It is an atypical expression of biotic altruism. 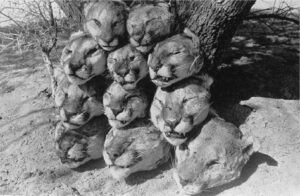 Many other nations followed suit in subsequent years, enacting their own endangered species laws. This shift in consciousness, in policy, and in ethics was a key component of the environmental revolution that has spread around the globe since the 1970s. This story below is about how a group of citizens in southern Arizona joined that revolution and helped bring its fruits to bear in the US-Mexico borderlands. Without the aid of a field guide, I can identify probably two or three dozen species of birds that share my yard in Portal, Arizona—a paltry accomplishment as there are over 550 wild bird species recorded in my state. The largest number of those species inhabit or seasonally visit the southeast corner of Arizona, a region called the Sky Islands, which has the highest biodiversity of any similar sized area in North America. It is a landscape of looming mountain ranges rising a mile or more into the sky from a sea of arid grassland and desert valleys. The cool, humid, densely forested peaks of the mountains offer a stunning contrast to the desert below. Typical basin and range geography of the sky islands. View from Chiricahua Mountains. Photo by Paul Hirt. 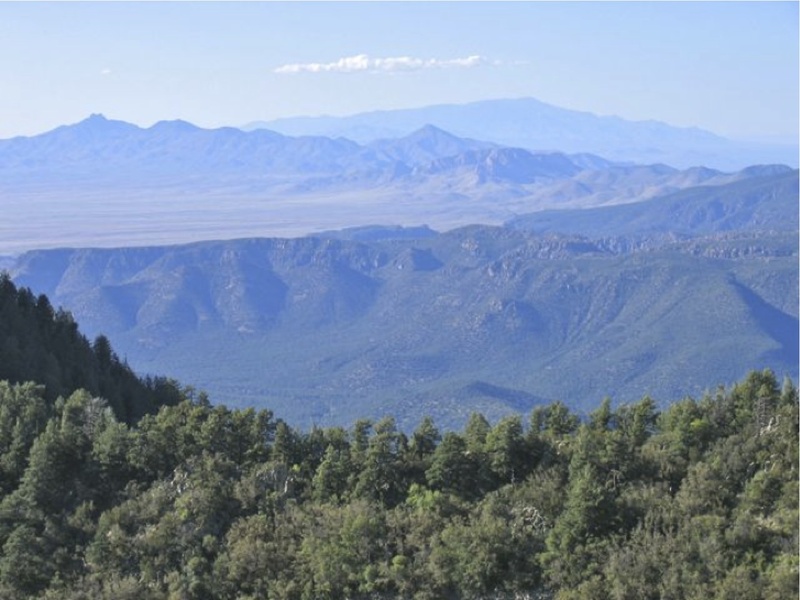 Going from bottom to top, the horizontal layering of life zones—desert to grassland to oak-woodland to pine and mixed conifer forest—explains part of the region’s amazing biodiversity. The other explanation is the region’s geographic location. Species diversity is greatest near the equator and declines as one travels toward the polar regions. A large number of subtropical and tropical species common in Mexico and Central America reach the northernmost extent of their range in southern Arizona. Birdwatchers from all over the U.S. and Canada make pilgrimages to the Sky Islands to see species like the elegant trogon that they cannot see anywhere else north of Mexico. There is one more biogeographic feature of the Sky Islands that contributes to its remarkable diversity of life. The region sits at the intersection of five great bioregions: the Rocky Mountains, the Sierra Madre Mountains, the Chihuahuan Desert, the Sonoran Desert, and the Neotropics. The valleys share species from the two great desert regions to the east and west, the Sky Island mountains share species from the two great cordilleras to the north and south, and both valleys and mountains along the Mexican border sport rare occurrences of neotropical species. It is a crossroads of life, with unique assemblages of species including many that are endemic to the region, like the Mount Graham red squirrel, one of more than two dozen species found only on Mt. Graham, the highest Sky Island (Sky Island Alliance; Center for Biological Diversity). Citizens inclined toward civic activism and concerned about the urban and natural environment in southern Arizona had been organizing volunteer associations to address environmental problems and pursue environmental protection goals throughout the 1960s and 1970s, particularly residents of the region’s largest city, Tucson. They advocated for pollution abatement, water conservation, ordinances to restrict development in flood plains and steep hillsides, restrictions on billboards, wildlife habitat protection, recreation area development, and preservation of wilderness on public lands (Logan 1995; Ferguson 2012). They made significant gains, though the challenges associated with population growth and suburban sprawl in this Sunbelt region tempered environmentalists’ sense of optimism. Their incremental accomplishments often seemed overshadowed by the more numerous incremental losses and by new threats. In 1990 one of those new threats emerged from the first Bush Administration, ironically in the form of a “recreation initiative” designed to ingratiate the administration to environmentalists and exemplify the “kinder and gentler America” he promised in his campaign. Bush’s Office of Management and Budget put several hundred million dollars into a special recreation fund to develop or upgrade campgrounds, picnic areas, roads, and trails. His administration then invited federal agencies like the Forest Service and Park Service to compete for this little pot of gold. 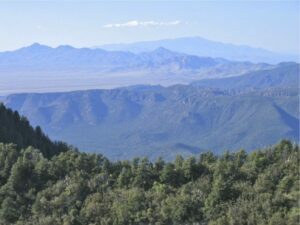 In response, the Coronado National Forest in southeast Arizona, which manages nearly all the sky islands north of Mexico, sought to designate several of its mountain ranges as a National Recreation Area in order to better compete for funding from this initiative. This proposal led to the formation of a new voluntary citizen organization with a transformative mission: to reshape how land managers, policy makers, and the public understood and valued the Sky Islands. In 1991, a handful of environmental activists from Tucson steeped in the new science of conservation biology gathered together to form a new organization whose primary mission would be to educate the public about the rich natural heritage of native species and habitats in the Sky Island region, to protect and restore that biodiversity, and to redirect the focus of federal land managers and policy makers from a purely anthropocentric orientation to more of a bio-centric orientation. Meeting in the Chiricahua Mountains, the group named itself after a little known memoir about life in the Chiricahuas published in 1967 by Weldon Heald, Sky Island (Heald 1967). When the US Forest Service proposed to designate large portions of the Coronado National Forest as a National Recreation Area in 1990, many of us [realized] we needed a new environmental vision for the region focused on living ecosystems, on wildlife and plants and free-flowing streams. And we longed for a proactive strategy — endlessly fighting bad ideas is hard on the soul. A group of us began a campaign to convince the Forest Service and the general public that the Coronado National Forest’s highest value was the diversity of life it supported. We collected data on the region’s biological wealth and built allies among the region’s scientists and conservation leaders. We quickly learned that the Coronado was king of biodiversity in the national forest system…. This richness extends well beyond the national forest boundaries, requiring a landscape-level vision of conservation that crosses state and national boundaries. (Sky Island Alliance, 20th anniversary report, 2011). SIA adopted innovative strategies to pursue its mission. The 1980s had been a time of political and cultural polarization—the Reagan Administration’s controversial Secretary of Interior James Watt symbolically on one side with Earth First! on the other. This polarization was driven by emotionally charged ideological positioning among interest groups and politicians that resulted in deep distrust and legislative gridlock. (The similarities between then and now are remarkable.) Consequently, by 1990 many people had grown weary of confrontation and sought more collaborative solutions and more on-the-ground work to bypass the temporarily dysfunctional world of policy makers. SIA followed this path. It started by working closely with scientists to ensure a credible foundation for its conservation initiatives. Then it built relationships with local, state, and federal agencies to influence land use planning in the region and launch protection and restoration projects. It organized and trained citizen-scientists to document wildlife movements and identify important wildlife migration corridors. It brought hundreds of volunteers into the field every year to repair degraded riparian areas, close and re-vegetate illegal roads in the backcountry, remove invasive non-native plants from sensitive areas, and improve endangered species habitat to assist in their recovery. It performed natural resource inventories, updated road and trail maps, wrote reports, sponsored an annual Sky Island Festival in Tucson, and co-sponsored with government and academic institutions three international scientific conferences on biodiversity and management of the Sky Islands in 1994, in 2004, and in 2012, with proceedings published by the US Forest Service (US Forest Service 1995 and 2005 and 2013). 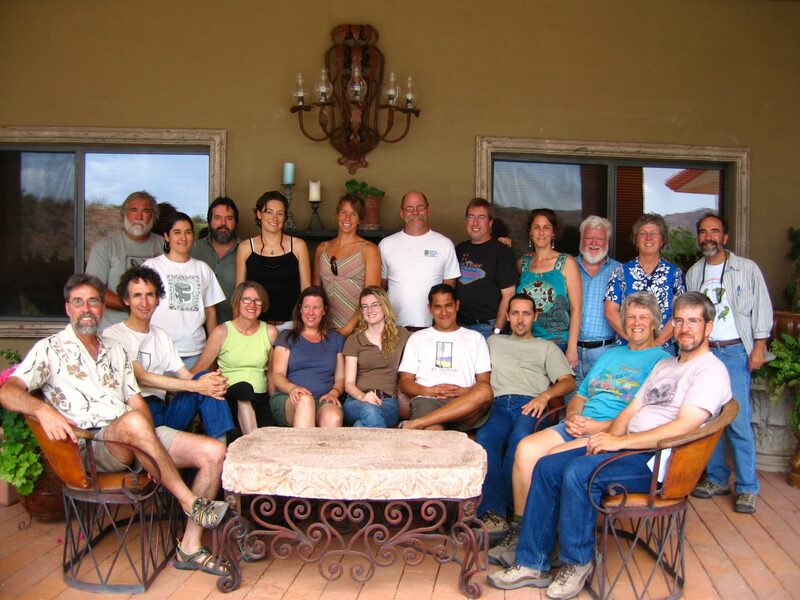 Sky Island Alliance board and staff at a strategic planning retreat at Rancho La Esmeralda in Sonora, Mexico, 2009. SIA quickly became a go-to organization for anyone looking for accurate information about the region’s biodiversity assets and threats. Public agencies charged with managing the region’s resources often turned to SIA for information and for people power when they wanted to get on-the-ground conservation work accomplished. Budget cuts and continuing political polarization had weakened and hamstrung many federal land managing agencies, so citizen organizations like SIA became important tools for problem-solving and collaborative action. This was a significant shift from the general strategy of environmentalists in the 1960s and 1970s who focused on getting policy reforms enacted at the state and federal levels. With the policy arena largely gridlocked, many environmental organizations, like SIA, focused instead on getting already established environmental policies effectively implemented at the grassroots level. SIA adopted two additional innovative strategies to advance conservation goals in the region: collaboration with private landowners, including many who were deeply skeptical of environmentalists, and cross-border collaboration with Mexican landowners, conservationists, and public agencies. Only a few other environmental organizations, such as the Nature Conservancy and the Sonoran Institute, pursued these strategies in the region. This marked an important step forward in ameliorating the distrust that had developed between ranchers and environmentalists and forging cooperative cross-border relationships between conservationists in the U.S. and Mexico. One of the principles of a “just” sustainability is to appreciate and preserve cultural diversity as well as biological diversity (UNESCO 2003). The shift from conflict to collaboration advances both goals simultaneously as it promotes understanding, empathy and and understanding of our interdependence. 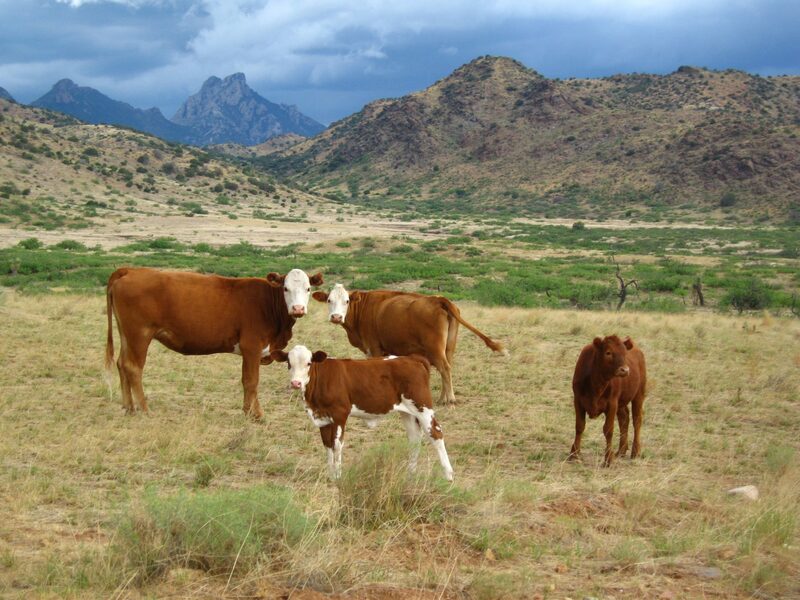 Cattle grazing on private land in Whitetail Canyon, Chiricahua Mountains. While the majority of the land in the Sky Island region is publicly owned and managed by various federal and state agencies, much of the valleys, grasslands, and riparian areas important for the region’s biodiversity are privately owned. SIA leaders realized early that a comprehensive landscape level approach to biodiversity conservation required a new social strategy of cooperation with a wide variety of landowners. 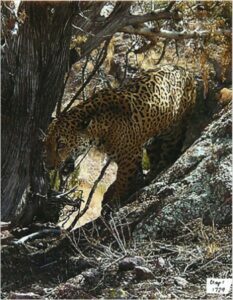 So it forged associations and joint projects with ranchers in the Malpai Borderlands Group in the U.S. and with large Mexican ranches in Sonora like El Aribabi, La Esmeralda, and Cuenca Los Ojos (http://www.skyislandalliance.org/jaguars.htm). In the 1980s the term “sky islands” was barely known and rarely used to describe the region. As a result of SIA’s advocacy, it is now the primary appellation for this basin and range landscape. The entire conservation community uses the term regularly. All local, state, and federal land agencies use it and prominently publicize the area’s uniquely rich biodiversity. Policy makers know and use the term. As a search of the web shows, during the past twenty years “the sky islands” have been the subject of numerous published books and articles, PBS documentaries, NPR stories, tourism brochures, nature adventure company websites…there is even a new Sky Islands Charter High School in Tucson. A group of grassroots activists successfully changed the conversation and reoriented public values regarding nature and culture in the region. the related shift to collaboration, people power, and on-the-ground action. A recovery program for the long extirpated jaguar is now in place (http://www.fws.gov/southwest/es/arizona/Jaguar.htm) aided by the establishment of a privately owned northern jaguar reserve at the southern end of the sky islands of Sonora (https://www.northernjaguarproject.org/northern-jaguar-reserve/). 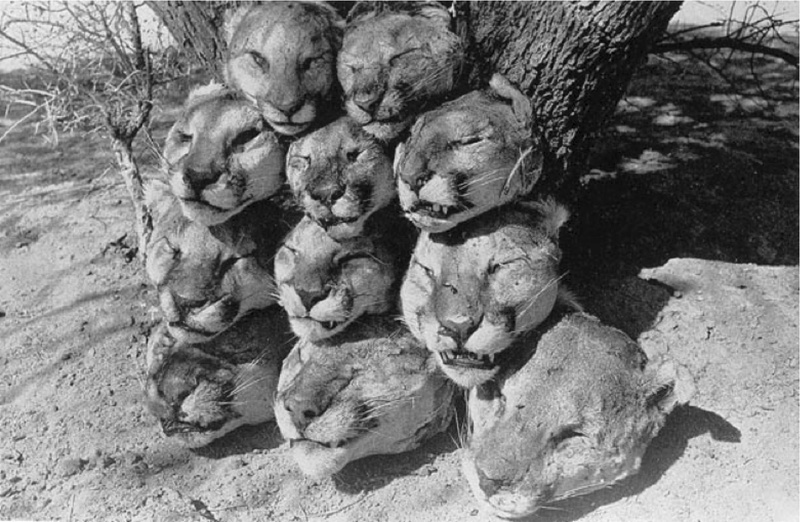 Predator control: severed heads of 11 mountain lions, Galiuro Mountains. Successful work with measurable results has bred a spirit of optimism for preserving native biodiversity and building a sustainable future, energizing local communities to work together to accomplish even more. But at the same time residents of the sky island region face continued threats to environmental quality, further declines in the health and stability of sky island ecosystems, and persistent social conflict and political gridlock. Perhaps the most prominent and representative example of this is the construction of the U.S.-Mexico border wall since 2005. Spurred by fears of terrorists infiltrating the country, Congress in 2005 authorized the Department of Homeland Security to construct approximately 500 miles of border fences/walls and exempted the agency from all environmental laws in order to fast-track it. The barrier, now about 700 miles in extent, is an acknowledged, unmitigated disaster for wildlife, hydrology, and international relations (Cordova and de la Parra 2007; Schlyer 2012). In 2009, the International League of Conservation Photographers created a stunning and moving visual documentary of the border wall and its impacts. See http://www.ilcp.com/projects/borderlands-rave. The US-Mexico border wall, Douglas, Arizona. Photo by Paul Hirt. 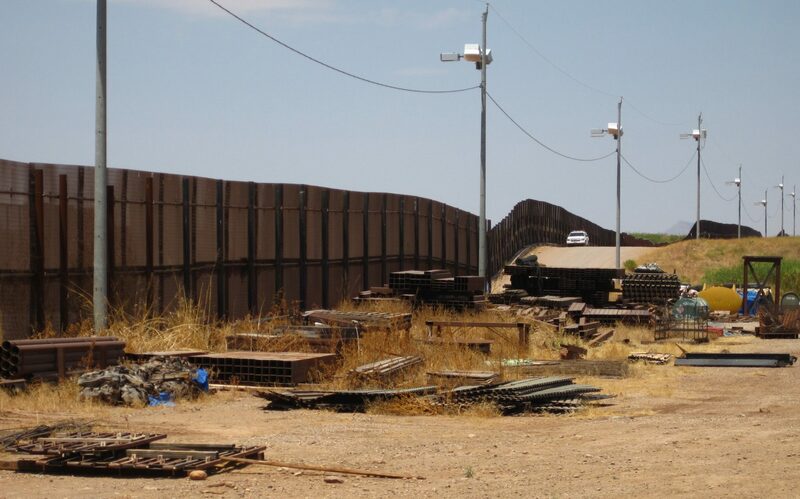 With significant support from local borderland communities, environmentalists and social justice activists fought the construction of the wall persistently but unsuccessfully. Outside the immediate border region, most Americans simply wanted the U.S. government to do something to “secure the borders,” regardless of the costs, environmental repercussions, or even the effectiveness of the measures. Drug war fears and anti-immigrant attitudes significant contributed to support for the border wall. This is just one example of how hope has been tempered, sometimes even overshadowed by concern. Yesterday, my wife Linda and I sat admiring a small wetland we created on our property in the Chiricahua Mountains with financial assistance from the US Fish and Wildlife Service and volunteer labor from members of the Sky Island Alliance. 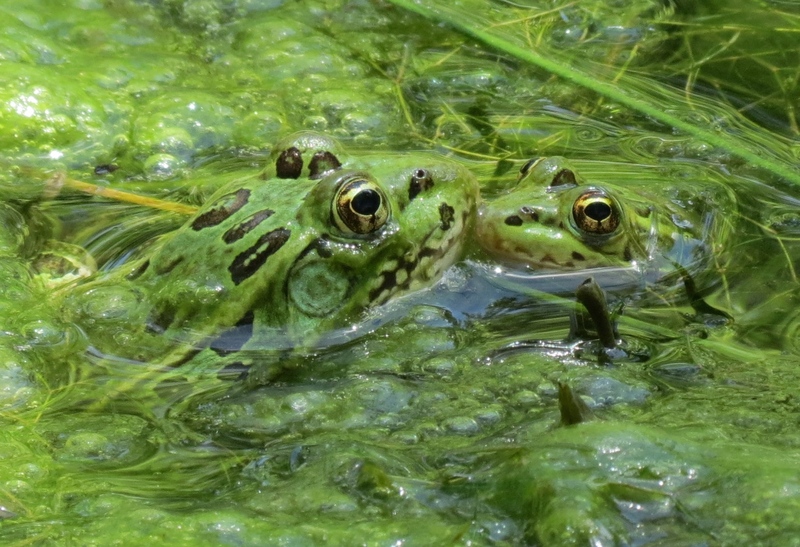 The tiny pond and marsh was designed as a breeding habitat for the endangered Chiricahua leopard frog. As private landholders, we are cooperating with federal and state agencies to recover this once common amphibian now on the brink of extinction. Between sips of morning tea we snapped photos of the frogs gobbling up insects and preparing for mating. Later in the afternoon, on a trip to Douglas for groceries, we saw down in the valley the long, straight, dark line across the landscape that marks the border wall, a massive obstruction that Mexican conservationists Ana Córdova and Carlos de la Parra called “a barrier to our shared environment.” It reminded me of the much larger challenges we face beyond the peaceful environs of our canyon home. Citizens concerned about environment, sustainability, and justice in the sky island region live daily with an irreconcilable mix of optimism and pessimism. Chiricahua Leopard frogs in Cave Creek Canyon Arizona, Chiricahua Mountains. Photo by Paul Hirt. Cordova, Ana and Carlos A. de la Parra, eds. A Barrier to Our Shared Environment: The Border Fence Between the United States and Mexico. Mexico: National Institute of Ecology, 2007. Ferguson, Cody. “This is Our Land, We have the Right to be Heard”: Community-Based Environmental Activism in the Late Twentieth Century. PhD dissertation, Arizona State University, 2012. Heald, Weldon. Sky Island: A Retreat into One of Nature’s Last Strongholds—The Spectacular Chiricahua Mountains. Van Nostrand, 1967. Jaguar Recovery Team, U.S. Fish and Wildlife Service. Recovery Outline for the Jaguar (Panthera onca). April 2012. Logan, Michael. Fighting Sprawl and City Hall: Resistance to Urban Growth in the Southwest. University of Arizona Press, 1995. Schlyer, Krista. Continental Divide: Wildlife, People, and the Border Wall. Texas A&M University Press, 2012. UNESCO. Cultural Diversity and Biodiversity for Sustainable Development. 2003. U.S. Forest Service. Biodiversity and Management of the Madrean Archipelago: The Sky Islands of Southwestern United States and Northwestern Mexico. Proceedings compiled by Leonard Debano. Ft. Collins, CO: Rocky Mountain Research Station. RM-GTR-264. 1995. U.S. Forest Service. Connecting Mountain Islands and Desert Seas: Biodiversity and Management of the Madrean Archipelago II. Proceedings compiled by Gerald J. Gottfried. Ft. Collins, CO: Rocky Mountain Research Station. RM-GTR-264. 2005. US Forest Service. Merging science and management in a rapidly changing world: Biodiversity and management of the Madrean Archipelago III. Proceedings compiled by Gerald J. Gottfried, Peter F. Ffolliott, Brooke S. Gebow, Lane G. Eskew, and Loa G. Collins. Fort Collins, CO: Rocky Mountain Research Station, RMRS-P-67, 2013. Van Devender, Thomas R., Dale Turner, Aaron Flesch, and Nicholas S. Deyo. “Biodiversity in the Madrean Archipelago of Sonora, Mexico.” In Gottfried, Gerald J.; Ffolliott, Peter F.; Gebow, Brooke S.; Eskew, Lane G.; Collins, Loa C., comps. Merging science and management in a rapidly changing world: Biodiversity and management of the Madrean Archipelago III. Fort Collins, CO: Rocky Mountain Research Station, 2013: 10-16.